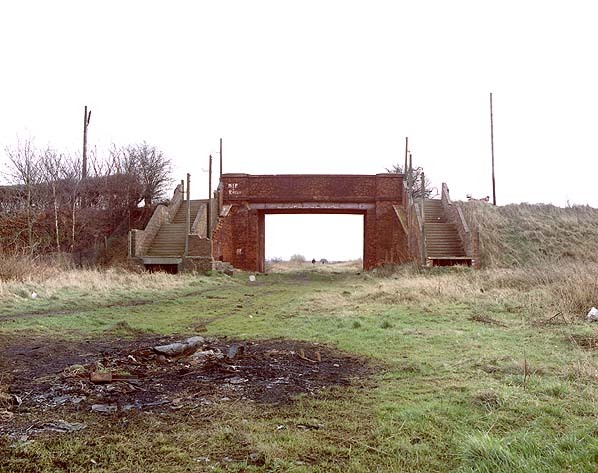 Present state: Demolished - the road overbridge incorporates steps down to the platforms these still remain. 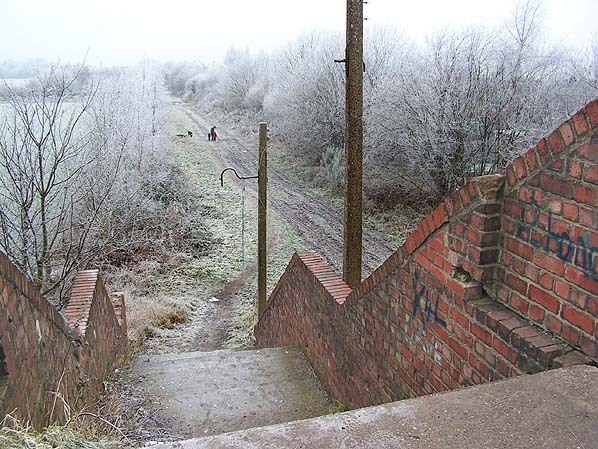 Notes: Notes: Newchurch Halt opened on what was then the LNER Glazebrook to Wigan Central line in 1943 to serve a nearby Royal Navy camp that had been set up for its Air Electrical School. From here a 1.5 mile branch was opened to cater for the huge ordnance works at Risley. The Risley Ordnance factory was served by two private stations, one at the end of the branch from Newchurch on the north side of the site which was open by 7.1941, the other was on the south side of the site on the Glazebrook - Padgate line; this opened on 2.4.1940. Many workers lived on site but hundreds where brought in by special trains from Wigan throughout the Second World War. The station on the Newchurch branch closed 2.1.1952. Following the war the Newchurch Halt remained open serving local trains northbound to Wigan Central and southbound to either Warrington Central or to Manchester Central. Latterly many services only went as far as Irlam. The station closed along with all of the others on the line on 2.11.1964. The line survived in stages for goods services until 1968. Today the steps leading down from Newchurch Lane can still clearly be seen as can a lamp column. The platforms which where very basic concrete structures have been removed.